2017 Topps Heritage High Number Baseball picks up where the 500-card early-season release left off. 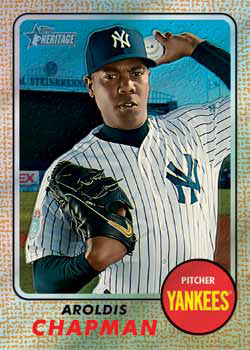 In a continuing nod to 1968 Topps Baseball, this is not Series Two, it’s not Update. True to the late 1960s, it’s High Number. High numbers start at 501 and end at 725 for a 225 card set. Cards 701-725 are sits base series set predecessor, look for one auto or one memorabilia card per hobby box. Plus, you will find one 1968 Style Box Loader per box. Short prints are seeded at one in three packs. The set promises rookie call-ups and traded veterans. With an August release date, we will not get the September call-ups, but it is sure to include the surprises to come out of Spring Training as well as early season additions to the 40-man. The parallels in High Number are very much a simple repeat of the initial set, with only the addition of Minis added. Gray Backs: These are very tough limited to only 10 of each. These could become known as the Venezuelan issue, as they mimic the back originally used in the exceptionally tough 1968 Topps Venezuelan Baseball release. Bright Yellow Backs: Limited to only 25 of each, these bright yellow backs mimic the backs used in Milton Bradley games. Blue-Bordered Parallels: Limited to 50, and are hobby only. Flip Stock Parallels have the uncoated clay stock on the front, and the coated print on the back. Limited to only five of each, these are also hobby only. Mini versions are randomly inserted and limited to only 100 numbered copies of each. Chrome returns as a partial parallel of 50 cards. Besides basic Chrome cards, there are several parallels exactly the same as the earlier Heritage base set: Refractor (/568), Blue Border (/68), Gold Border (hobby only, /5) and SuperFractor (one-of-one). Randomly inserted hobby boxes have exclusive Hot Box Refractors. These are one pack per Hot Box. There will be five different short print variations. These include Error short prints that reproduce errors from the original 1968 set. Trade Variations, also like the 1968 set, Throwback Uniform variations, Action Image Variations (hobby only), and Team Name Color Variations (hobby only). Real One Autographs continue to be the driving force behind the signed cards. Sticking with the brand’s tradition, all are signed on-card. Signers are a mix of active and retired players. Special Edition parallels are signed in Red Ink and come numbered to 68. Real One Dual Autographs are also signed on-card despite having multiple signatures. Exclusive to hobby packs, all are hand numbered and in limited supply. Series One Heritage delivered some huge hits from this set like the Ryan/Bench dual Rookie. Watch out for some more beauties in these High Numbers. Nolan Ryan Highlights Autographs are new to this High series. Hobby only and numbered to only five copies, these showcase highlights of The Express’s career. 1968 Poster Box Loader Autographs are styled after the 1968 oversized posters and feature on-cards autos hand-numbered to only 10. Clubhouse Collection Autographed Relics remains a theme that combines autos and relics together. 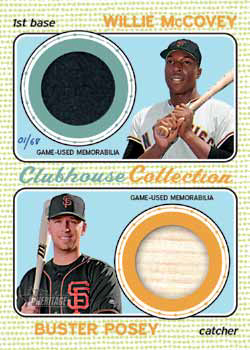 Basic versions have a piece of an active player’s game-used jersey or bat. Different from the Series One set, these print runs are not announced. The Auto/Patch parallels (one-of-one) remain hobby only. nd retired players that may include players from 1968 paired with active players. A one-of-one patch parallel can also be found for each version. Clubhouse Collection Autograph Relics continue in 2017 Topps Heritage High Number Baseball. These have Patch parallels that are one-of-ones as well as dual versions with two players. 1968 Baseball and 1968 Celebrity Cut Signatures provide additional autographs. All feature personalities popular at the time and all are numbered one-of-one. Basic inserts are changed up a bit in Heritage High Numbers, including non-specific odds. Then and Now Highlights from the 2017 season with connections to the 1967 season. 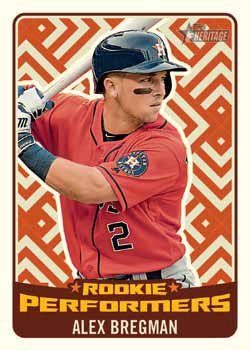 Rookie Performers, Combo Cards, Award Winners (from 2016) and Nolan Ryan Highlights, which is hobby-only. Every hobby box comes with one box loader bonus card. 1968 Ad Panels come as three-card strips. There are also 1968 Topps Originals, buyback cards from 1968 that have a special foil stamp, and the 1968 Posters limited to 50.